Bioshock Infinite was one of the best reviewed games of 2013. It’s sold over 6 million copies since March 2013 and won several “game of the year” awards. It was hailed by many critics as the latest proof that big budget, mass-market games could be something more than just the gaming equivalent of a Michael Bay blockbuster. And less than a year after it was released, almost all of the people that worked on it were out of a job. Joe Fielder, a writer and producer on Bioshock Infinite, was one of the dozens of designers who lost their jobs when Irrational Games closed this past February. “I can say it was a surprise, but it wasn’t a complete surprise,” he says from his home in Boston. Fielder and a few colleagues from Irrational regrouped quickly, forming Day For Night Games a couple of months after Irrational shut down. Their first game, The Black Glove, is currently in development, and they’re seeking funding through a Kickstarter campaign set to end this Friday. 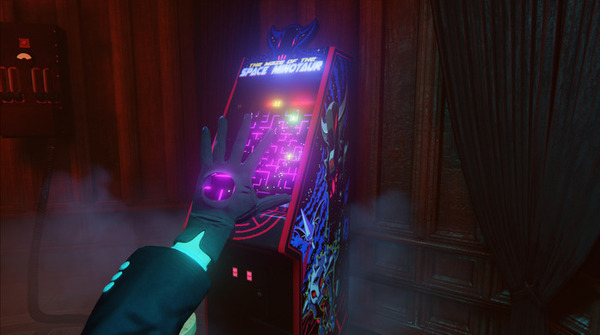 Bioshock’s DNA can be seen clearly in The Black Glove. Fielder himself calls it “Bioshock mixed with Twin Peaks.” It’s set in a 1920s theater called the Equinox, with rich red curtains that immediately recall the Black Lodge scenes from David Lynch’s Twin Peaks, and a trio of “artists in residence” that are successors to the vivid characters from Ken Levine’s Bioshock and Bioshock Infinite. As described by Fielder, The Black Glove sounds equally indebted to Lynch’s surrealism and Levine’s interest in art, philosophy and psychology. The influence of David Lynch, who Fielder dressed up as for Halloween this year, can be seen in the Equinox’s “dream logic world that has its own sort of rules,” Fielder says. It’s not a horror game, but Fielder hopes that it’s deeply unsettling for the player, like a Lynch film. “Games have gotten a little too dark over the last few years,” he says. “I’m a huge horror fan, but I feel like games have overused” the language of horror films. This sort of control over time is appealing to Fielder as a creator because it lets the narrative of a game become as interactive as the game itself. “A lot of games that are narrative focused are more about just uncovering narrative. The player doesn’t really have a direct hand in altering the story,” Fielder says. “We wanted to look at what a branching narrative looks like when the player has a choice over nine different aspects of a character’s past. One of the ways players will alter their environment is through a game within the game. Within the first-person world of The Black Glove is a game called The Maze of the Space Minotaur, an ‘80s-style arcade game that on the surface looks like Berzerk, with a stick figure navigating a maze and shooting deadly enemies. Fielder says it plays like a mix between Wizard of Wor and Bomberman. What you do in Space Minotaur impacts The Black Glove in a myriad of ways, from unleashing powerful monsters into Equinox to unlocking new environments and narrative branches. With Space Minotaur Fielder hopes to hearken back to a simpler time for games. “There was an appeal to games from the ‘80s where everyone off the street could walk up and grasp the basics of the game and start playing,” he says. “If you hand somebody an Xbox or Playstation controller these days and they don’t play games they might look at it like a porcupine, like they don’t know what to do with all these buttons. Before Bioshock Infinite Fielder worked on Boom Blox and a variety of Medal of Honor games for EA. He describes his time at Irrational as a “master’s class in game narrative taught by some of [his] favorite writers in the industry. 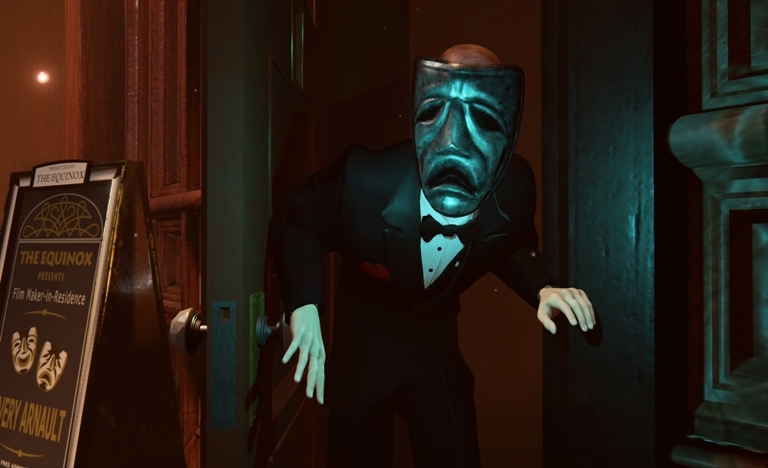 It was fantastic.” Despite that, and despite The Black Glove’s fate hinging upon the success of its Kickstarter this week, Fielder sounds excited to have moved on to a smaller and more egalitarian project, and not just because he gets to work from home now. “It’s been a lot more of a flat hierarchy,” he says about Day For Night’s structure. “Working at Irrational was like working for a show-runner for a TV show. In this case if one of the people working on a level or elements or art has a better idea we’ll adopt that idea instead and run with it.